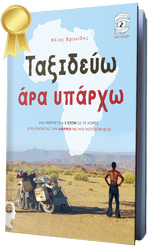 « Ethiopia: What a special country! We had planned our itinerary in order to follow the religious festivals around Northern Ethiopia. 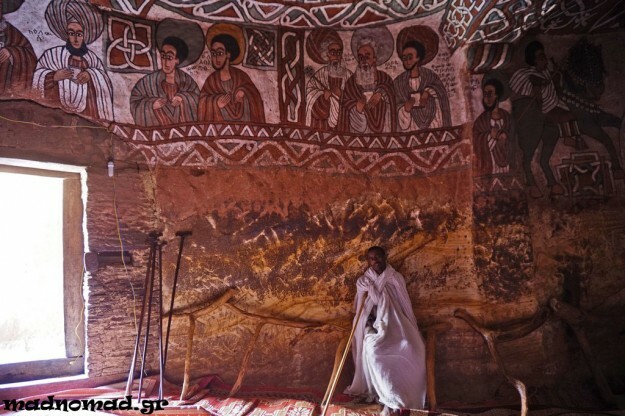 Celebrating Christmas in the medieval, rock-hewn churches of Lalibela is a unique experience. During the night, thousands of pilgrims congregate around those grand monuments which were painfully carved out of the rock, some of them being monolithic. The yard, the rooms, the pillars, the decoration, everything was formed by carving a single piece of rock! The Christmas liturgy lasts the whole night with people chanting all together, praying and reading holy books with candles lit up. 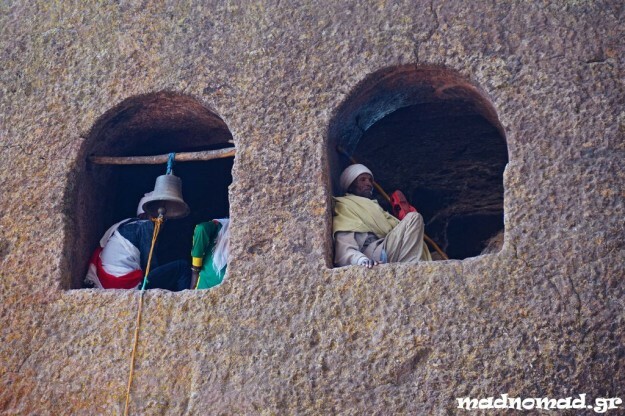 Thousands of pilgrims spend the whole night of Christmas chanting, praying and reading holy books in the medieval, rock-hewn churches of Lalibela. 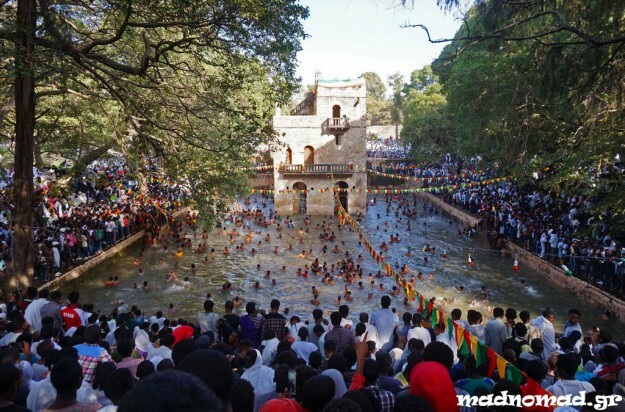 The most important religious festival in Ethiopia is Epiphany. The best place to celebrate that is Gonder, famous for its 17th-century African castles! The most famous of them is the impressive 32-meter (105 ft) tall Palace of Emperor Fasiladas. The celebration, actually, takes place in Fasiladas’ Baths. The huge pool is slowly filled with water over a period of three days. At the morning of Epiphany Day, when a priest puts out a candle in the water, it becomes blessed. That moment hundreds of devotees jump in the pool laughing and throwing water all over the place! People give them bottles to be filled with holy water while youngsters jump from really high trees in the shallow pool. 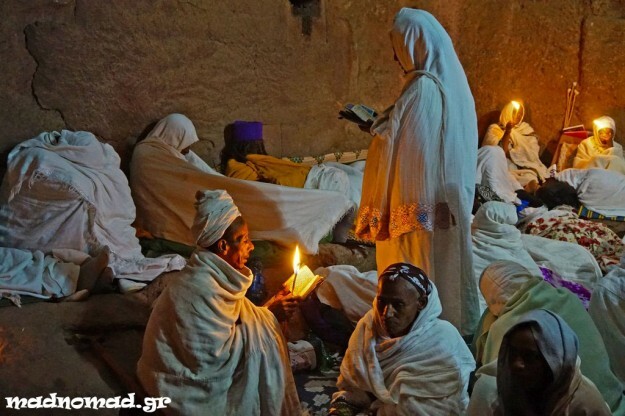 Epiphany is the most important religious festival in Ethiopia. Hundreds of devotees jump that day in Fasiladas’ Baths at Gonder! We crossed the beautiful Simien Mountains and after cornering the whole day on lovely and quiet mountain roads, we reached Aksum. That was the capital of the ancient Kingdom of Aksum. An advanced civilization started to develop there as early as 400 BC. Some huge steles stand there since ancient times, including the Great Stele, which was the largest single piece of stone that humanity ever tried to erect. It was weighing an enormous 520 tonnes! Things went wrong, however, and the Great Stele was left broken on the ground. 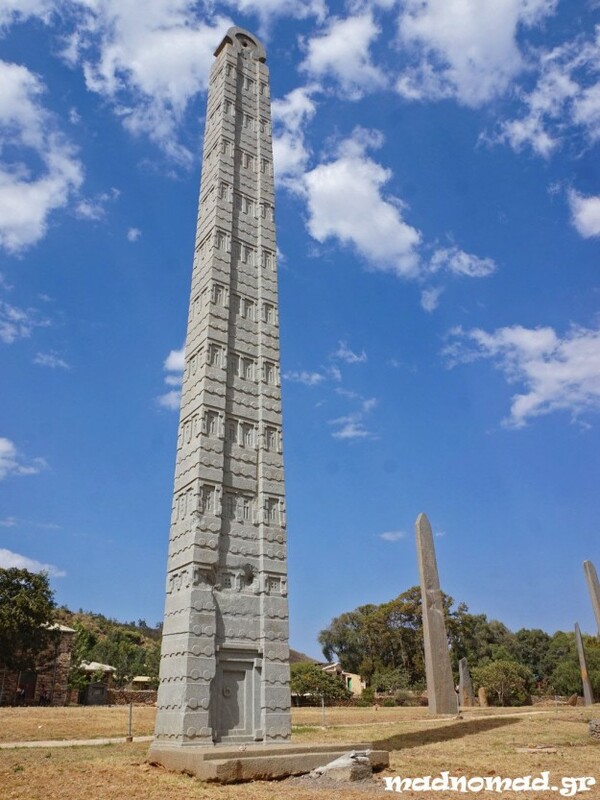 An advanced civilization started to develop in the Kingdom of Aksum as early as 400 BC. These huge steles were playing the role of tombstones and monuments to the local rulers. After admiring the remote, medieval, rock-hewn churches of Tigray region, it was time to explore the most unique place in the whole of Ethiopia: the Danakil Depression! 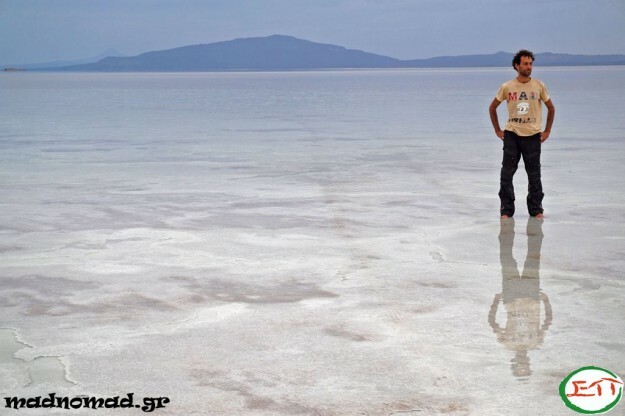 That’s like going to Mars… It’s one of the lowest and also the hottest inhabited place on earth. It is located next to Eritrea at 125 m (410 ft) below sea level. The temperature there often exceeds 50o C (122o F)! 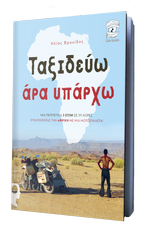 Only Afar people can survive in this inhospitable area but even themselves live a semi-nomadic life. They move to the mountains every summer. 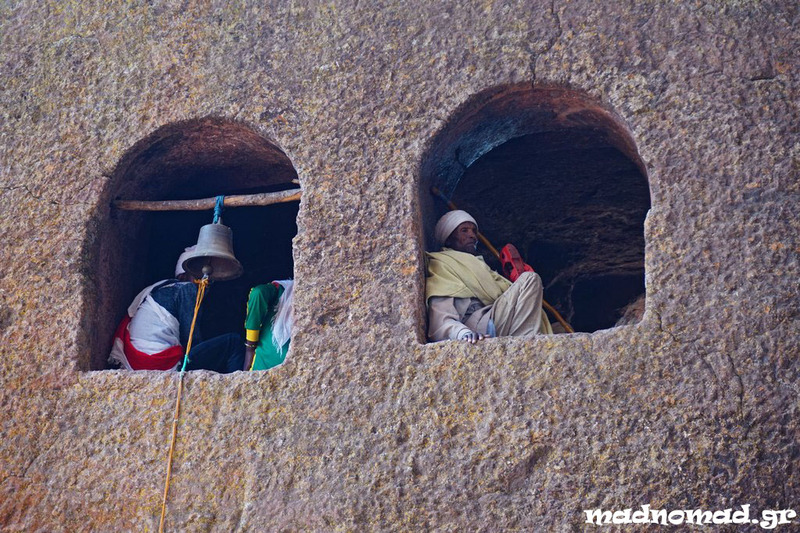 Abuna Yemata Guh Church is carved in a small cave halfway up a rock pinnacle. It’s a steep and scary climb but the setting and the old frescoes are worth the effort! 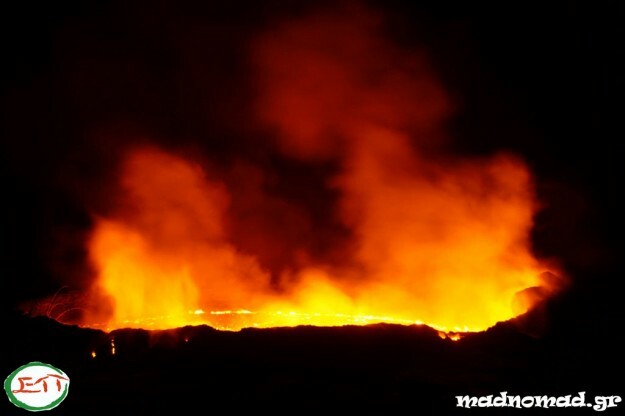 It is not allowed for independent travellers to visit the Danakil Depression by themselves. 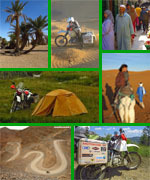 So, I had to use the services of Ethio Travel and Tours (E.T.T.) 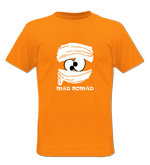 and join a group. That landscape is definitely worth the effort… It’s amazing to see the Afar people extracting salt from the ground the same way their ancestors were doing hundreds of years ago. Even today the camel caravans are seen travelling for five days from -125 m (-410 ft) altitude to about 2,100 m (6,890 ft) in order to sell this precious commodity in the town of Mekele. 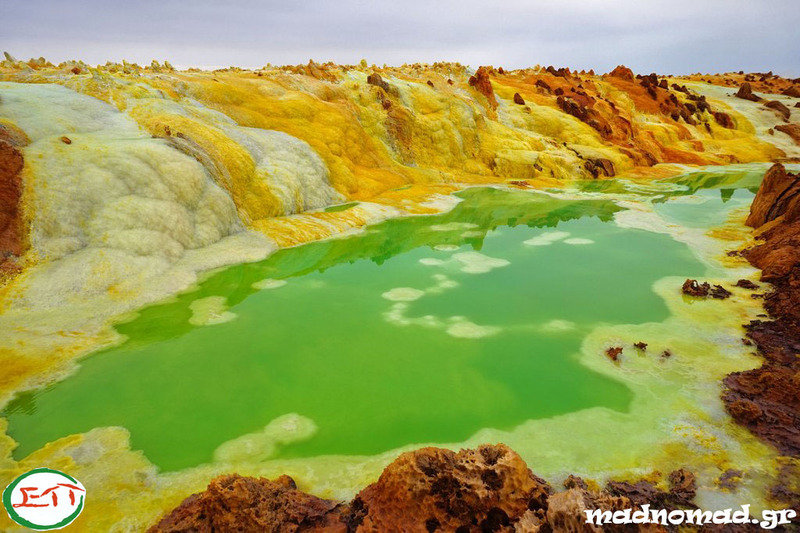 Dallol Lake is an unearthly sight by itself… The rich minerals of the ground make an extraordinary colourful natural palette! Sulphur gives the yellow colour, copper gives the reddish, manganese gives the purple and salt fills in like snow with its white colour making weird formations. The water sounds bubbling and you must be careful not to let your toe in, since that thing is really acidic! That’s not Planet Mars… It’s still on Earth! That’s the natural palette of Dallol Lake! It was only becoming even more astonishing as we were approaching another enormous feature of Mars… eh, sorry, we are still on Earth! I never imagined I could be so close to one of the most active volcano’s crater, Irta’ale! We could actually see the lava floating and exploding. In the absolute darkness of the area, the flaming red lava was looking like an endless set of fireworks! I never imagined I could be so close to one of the most active volcano’s crater, Irta’ale! After almost three months and 8,500 km (5,282 miles) exploring this unique country, I can only confirm what is known about Ethiopia. Yes, the hassles are plentiful and many locals are not friendly. Unfortunately, they often make visitors feel unwelcome. We met tourists booking a flight urgently out of Ethiopia to save their holidays! If you are looking for a country where you can relax and enjoy your vacations, Ethiopia is not the ideal one. But if you are looking for adventure and a unique culture with ancient roots to experience, then Ethiopia will mesmerize you! Everything is carved out of rock in the medieval churches of Lalibela.